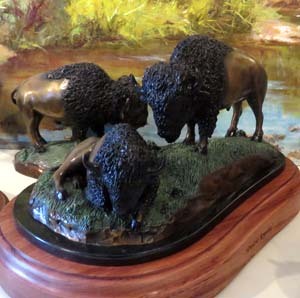 These buffalo in bronze created by Carey Hosterman are small enough to sit on a desk or bookshelf. Carey Hosterman has been helping sculptors turn their clay art into bronze for over 30 years. 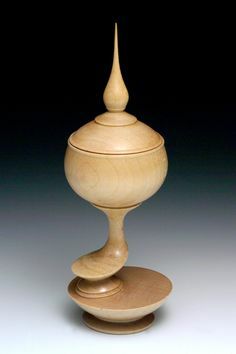 At the same time, he has been developing his own skill as a sculptor. The buffalo pictured here, small enough to sit on a bookshelf, are currently his bestselling creation at Rocky Mountain Bronze Shop, the Loveland business he started 21 years ago. Loveland, where Carey has lived since boyhood, has long been a center for producing bronze sculpture. Bronze shops sprouted up specializing in various phases of the long, involved process. Each step in turning a clay form into bronze requires unique skills and great care to ensure that the final bronze sculpture replicates every fine detail that the artist put into clay. Some of those shops disappeared during the economic downturns of the 2000s. Nonetheless, Loveland continues to be a center for bronze art, and Carey Hosterman still handles the work of renowned sculptors like Judy Nordquist, Bobbie Carlyle, and Stephen LeBlanc, as well as turning out some of his own. 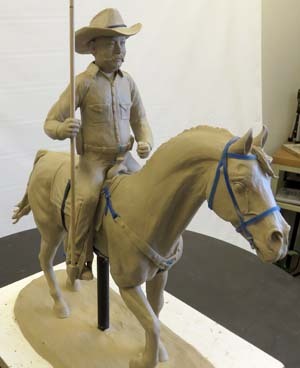 This mounted posse in clay, a work still in progress, will become a bronze sculpture by Carey Hosterman. When I visited Carey at Rocky Mountain Bronze Shop a month ago, he was working on a mounted posse sculpture for a Colorado client. He hadn’t quite completed the clay form that would become the “pattern” for the final bronze sculpture. I noticed the blue lines that made up some of the horse’s tackle. It’s jeweler’s wax, Carey explained. Objects in addition to clay can be used to make the pattern for the mold that will eventually hold molten bronze. He showed me the clay flag that would eventually drape from the pole that the rider is carrying. We both chuckled over the rows of tiny candy stars he had meticulously set into the corner of the flag. What I found hard to accept was the fact that this true-to-life clay sculpture would probably be damaged in the next step. 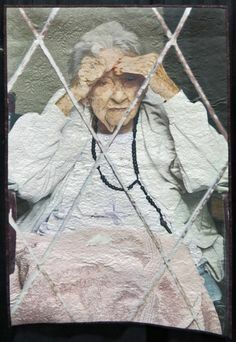 Carey was going to send it out to one of the shops that paints layers of liquid rubber onto clay patterns and then sets the entire work into plaster. The cured rubber, held in shape by the plaster, would become a mold for a wax replica. When the rubber pulls away from the clay, there’s a good chance the clay sculpture will pull apart. The good news is that if the person who applies the rubber does it just right, every little fold, every button, even every whisker in the mustache will be preserved exactly as Carey sculpted it. The rubber mold, set in plaster, will come back to Rocky Mountain Bronze Shop for the making of the wax replica. From the wax replica, another mold will be made of silica. In a kiln, the wax will burn off and the silica sand will become a shell hard enough to hold molten bronze. 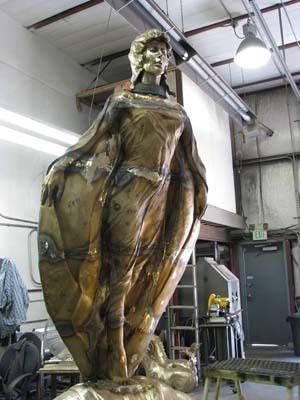 For a large sculpture, like this version of “Seaswept” by Bobbie Carlyle, molten bronze is poured into several molds, and the cooled pieces must be welded together. Part of the challenge of a large bronze sculpture is making sure that the pieces of bronze align perfectly and that the seams are invisible. Carey himself does this part of the work at Rocky Mountain Bronze Shop. He pounds, stretches, sands, and polishes the bronze before it is ready for the last steps. 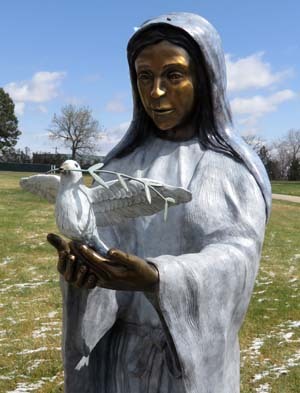 Carey Hosterman’s “Our Lady of Peace” stands in Resthaven Cemetery in Fort Collins. When I think of bronze, I envision rich, warm brown. The natural color of bronze sculpture after polishing, however, is pale gold. Left as it is, the metal, mostly composed of copper, would oxidize over time. The brown I envision is the result of chemicals applied after polishing. 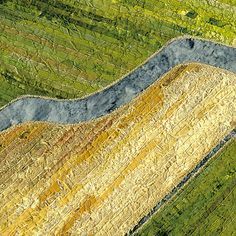 Any color is possible, though, if the right chemical formula is used. A final wax coating prevents future oxidation. Acrylic color is also a possibility. That’s how Carey finished the dove and the clothes on his “Our Lady of Peace” that stands in Resthaven, the cemetery on College Avenue at the south end of Fort Collins. He applied intense heat to the sculpture so that the acrylic color would bond with the bronze permanently. Incidentally, Carey sculpted this work in clay twice — once in a tabletop version for the client’s approval and again in the full size. Whether Carey is overseeing his own work or another’s, the patina or acrylic color is applied by Carey and his assistants at Rocky Mountain Bronze Shop. 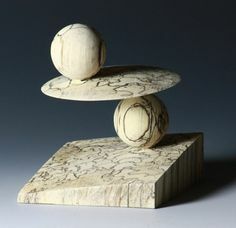 The finished sculpture is truly a collaborative effort between artist and artisans. In the case of “Our Lady of Peace,” Carey finished it differently for two different clients. He created the first version for a church in Silverthorne, Colorado. If you check out the picture of it on the Rocky Mountain Bronze Shop website, you can see how much the patina changes the visual statement of the sculpture. Another place to watch online is the shop’s Facebook page, where you can see photos of large statues that the shop produces. Last month a picture appeared of life-size horses that Carey finished for sculptor Judy Nordquist. Their ultimate owner: royalty in the Middle East. 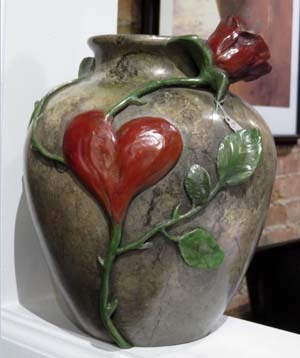 This bronze vase by Carey Hosterman was on display at Rabbask Designs in Loveland, where owner Jacki Marsh carries work by numerous local artisans. Rocky Mountain Bronze Shop has a small gallery in front of its workroom on 8th Street in Loveland. 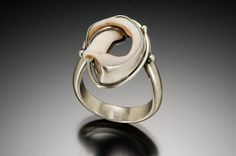 Monday through Friday until 4:00 p.m. you can see Carey’s small sculptures as well as his handmade jewelry — another of his artistic interests. 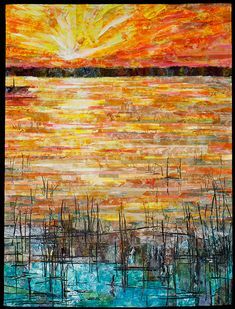 You’re also apt to meet Amy Hosterman, Carey’s lovely wife of 25 years who works in the office and the studio. Not far away on 4th Street, Jacki Marsh displays small bronze pieces by Carey and by Bobbie Carlyle in her shop Rabbask Designs. 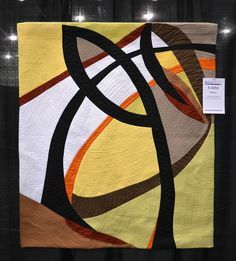 Her shop is a great place to stop any time you want to see work by local artisans. Thanks to Jacki, I met Carrie Lambert and Mike Medeiros, whose work appeared recently on the blog, and I discovered Rocky Mountain Bronze Shop. This entry was posted in Metal and tagged bronze sculpture on April 29, 2015 by Sally.